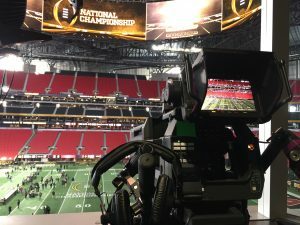 2018 was one of the most eventful years for sports production in recent memory, with the 2018 PyeongChang Olympics and 2018 FIFA World Cup capturing the nation’s attention over the summer and annual events like the College Football Playoff National Championship Game, Super Bowl, NFL Draft, and others breaking production records and test-driving new technologies and workflows. As if there weren’t enough going on stateside, this year’s Road Warriors features an expanded look at what went on across the Atlantic. Here is Part 1 of SVG’s a look at some of the sports-production highlights from the past year (CLICK HERE for Part 2). The CFP National Championship Game on ESPN featured the biggest production ever for a bowl game, thanks to the use of 125 cameras (between game, studio, and MegaCast coverage) and a game production coming out of nine Game Creek Video remote-production units. Camera and audio developments brought the viewer closer than ever to Alabama’s come-from-behind OT victory over Georgia. ESPN deployed 125 cameras to capture the CFP National Championship action at Mercedes-Benz Stadium in Atlanta. A new element in the production was a small RF camera that 3G Wireless installed in each of the four down markers on each side of the field. It had been tested at the Celebration Bowl and the Sugar Bowl. Also new were two hat cams: cameras mounted in the caps of two of the folks who moved the chains up and down the field. According to LaChance, the cameras did not require bodypacks, making them lighter and less obtrusive when worn by officials on the move. The eight pylon cams also got a lift, with a microphone placed in the pylon at each corner of the end zones. They offered a total of 28 angles of video coverage. The specialty cameras complemented the 51 other cameras deployed for game coverage, primarily a mix of Sony HDC-4300, HDC-2500, and HDC-4800 cameras coupled with Canon lenses, including two 95X super-telephotos. Nine Game Creek mobile production units and support vehicles were onsite: Peacock A and B at the core of the game production, Nitro A and B handling GameDay and SportsCenter needs, Maverick overseeing the MegaCast, Webby on hand for the SEC Network, and Edit 2 and 3 supporting the game and MegaCast. BSI was onsite for RF needs (13 cameras), and PSSI provided satellite-uplink facilities. LaChance expressed his pride in the work done by everyone involved in getting the production facilities up and running in five days. CLICK HERE for SVG’s full CFP National Championship Game coverage. Each year, the Super Bowl broadcaster looks to up the technological ante at America’s highest-profile sports event. For Super Bowl LII, to put it simply, NBC’s overall presence in the Twin Cities was mind-blowing. And not to be forgotten: just five days after the Philadelphia Eagles won their first Super Bowl title in franchise history, the Peacock embarked on an even larger-scale production in Korea with the Opening Ceremony at the 2018 Olympic Games in PyeongChang, South Korea. 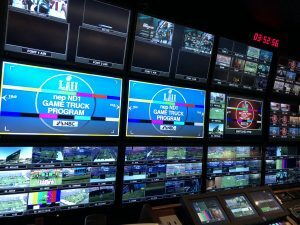 Inside NEP ND1’s A unit, which served as the core of NBC’s Super Bowl LII game production in Minneapolis. “This has been 2½ years of planning, and we have meticulously walked through every aspect technically and operationally,” said Ken Goss, SVP, remote operations and production planning, NBC Sports Group, prior to the game. In terms of the game production, camera levels were (not surprisingly) at an all-time high. The 73-camera complement (featuring primarily Canon lenses) included 20 miniature cameras for the Admiral Video PylonCam system added to a bevy of 4K and high-speed systems: four Sony HDC-4800 4K robos, three HDC-4300’s in 4K mode, four HDC-4300’s running at 4X slo-mo, another seven HDC-4300’s running at 6X slo-mo, and two more HDC-4300’s at 8X slo-mo. NBC once again deployed two SkyCam systems — a low and a high — as it did for selected games in the second half of the season on Sunday Night Football and Thursday Night Football. The camera complement also comprised nearly a dozen robos (provided by Fletcher), including a pair of new positions: an HDC-4800 overlooking the entirety of each end zone to capture close plays along the side or back lines. With 14 mobile units onsite, NBC Sports was forced to expand its compound beyond the loading-dock area inside U.S. Bank Stadium. Although this is the norm at any Super Bowl, the potential subzero temperatures of a Minneapolis February made an outdoor compound unviable. Therefore, NBC erected a massive climate-controlled tent just outside the stadium to house the overflow trucks. CLICK HERE for SVG’s full Super Bowl LII coverage. NBA All-Star festivities once again served as a showcase for Turner Sports’ tech-savvy production efforts on the hard court. Included in Turner’s bag of tech toys were an RF pylon cam on the Skills Challenge, shot-tracking technology for the Three-Point Contest, and an even more intricate ecosystem inside its already massive truck compound. 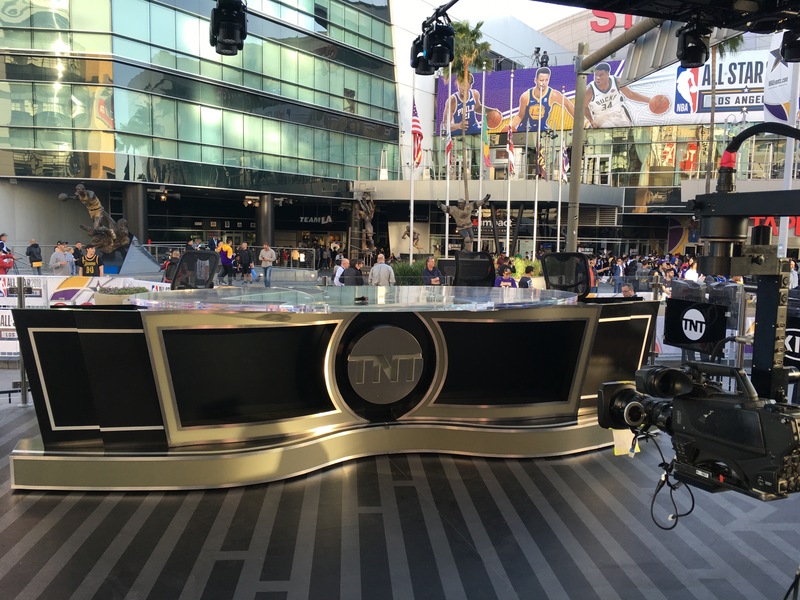 Turner Sports took over the Staples Center and LA Live in February. The raucous atmosphere of All-Star Saturday Night tipped off with the Skills Challenge, and fans had a new perspective on the three-round, obstacle-course competition, in which the players dribbled down the sidelines, weaving in and out of pylons. Turner worked with AVS to deploy an RF system featuring a GoPro/Vislink Herocast miniature camera sitting atop two of the pylons. The pylon cam was just one of a whopping 48 cameras deployed by Turner during the weekend for the All-Star Game, All-Star Saturday Night, Inside the NBA studio sets, and NBA on TNT Road Show concerts throughout the weekend. Also among them were two additional RF cameras (also from AVS) and six robos (from Fletcher). Turner’s truck compound was located at the top of the steps of the L.A. Convention Center and comprised 13 total mobile units, which arrived on Feb. 8 — more than a week before All-Star Weekend. NEP’s ND1 (A, B, C, and D) was once again at the core of the compound, serving as the audio- and video-routing/distribution center for the entire show. ND1’s B unit served as the primary distribution point for the compound. All camera and audio feeds were fed into ND1 for distribution to the various trucks. Thanks to ND1’s robust fiber connectivity, the A, C, and D trucks were also able to serve as signal-distribution points for other trucks, shortening the length of cable runs throughout the compound. In addition, Turner used ND1 for a variety of other needs, including submixing in the B unit’s audio room and transforming the C unit’s EVS replay area into “edit central” to handle its extensive file-based workflows. CLICK HERE for SVG’s full coverage of the NBA All-Star festivities. The athletes weren’t the only ones who put in months of training and preparation ahead of the Winter Olympics. 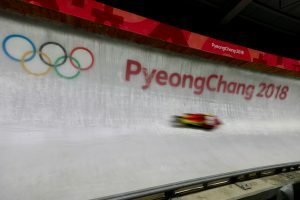 NBC Olympics took its pre-Games preparation to a whole new level, testing and retesting nearly every technical system at its broadcast-production facility in Stamford, CT, prior to their use at the 2018 PyeongChang Games. A Skeleton competitor speeds by the Olympic rings at the Olympic Sliding Centre. He credited a few things for NBC’s being ahead of where it usually is at that stage of preparation. Olympic Broadcast Services (OBS) and the PyeongChang Organizing Committee for the Olympic Games (POCOG) took construction of the International Broadcast Center (IBC), venues, and facilities to a new level of readiness, especially compared with recent Games. The 2016 and 2014 Olympics in Rio and Sochi, respectively, were plagued with construction delays, equipment shortages for things like outlets and power, transportation issues, and more. That was not the case in PyeongChang. This was also the second Games for which OBS had disassembled the previous IBC building, packed it into more than 300 shipping containers, and rebuilt it at the new location. While OBS and the South Koreans were busy getting the venues and the IBC ready to go, the NBC Olympics team in Stamford was spending months making sure the IBC systems were tested and retested to ensure that they would be ready for the massive workload. In terms of the technology and the production, the team made a lot of changes on the venue side of operations and a bunch of small tweaks to the IBC operations. NBC’s NEWBERT flypack was deployed for hockey coverage from the smaller hockey arena and the Closing Ceremony. The NEWBERT system is contained in six flight cases and includes a good-size Evertz EMR 64 router. The flypack also houses a Lawo-based audio core, a small intercom system, and an EVS replay unit. An AT&T Media Links frame sent 36 feeds from the Closing Ceremony to Control Room X in Stamford through a 10-Gbps link. CLICK HERE for SVG’s full coverage of the PyeongChang Games. In Year 8 of the March Madness partnership between CBS Sports and Turner Sports, Final Four operations ran more smoothly than ever. The most notable change came in the form of a major presence by Game Creek Video. Five mobile units, four supporting the main game production in some capacity, anchored the compound. The new 79, which had debuted just six weeks before, served as host to the main production on TBS. 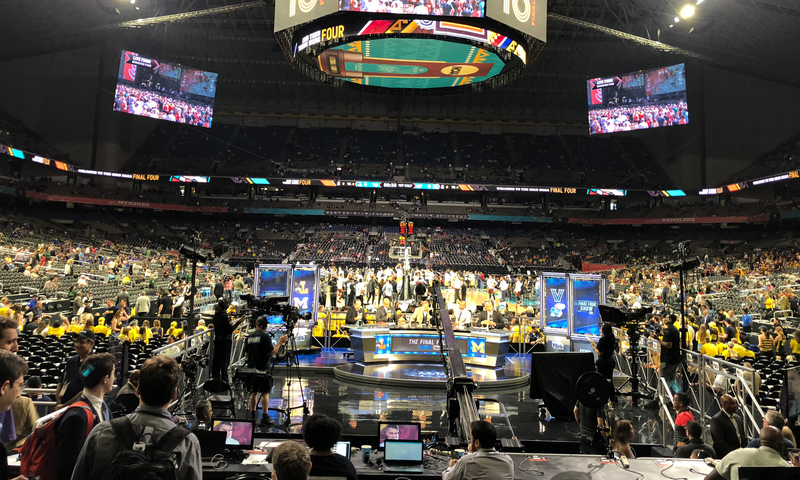 An onsite set in the fan section of the south end of the Alamodome anchored Turner Sports’ pre/postgame and halftime coverage at the 2018 NCAA Men’s Final Four. According to Brown, the refreshed IP backbone helped expand the compound’s capabilities and reduce its footprint. What may have taken four or five trucks in previous years was down to three. NEP also had a robust collection of mobile units onsite, supporting both the TeamCasts and other needs. Chromium was home to TBS’s pre/postgame and halftime onsite studio coverage. Inside the Alamodome were 54 cameras covering action for the main game, supplementing the TeamCasts (which returned for the production), and shooting the onsite studio set positioned at the south end of the arena. Five cameras at Turner’s special set on San Antonio’s iconic River Walk brought the total deployed to 59. Back in the mix were SkyCam Wildcat, a collection of Sony HDC- 4300 high-speed cameras, Bexel’s Clarity 800 camera (which, for the second year, was positioned at the base of the basket stanchions), and the popular Rail Cam system. Each year, NFL Media and ESPN roll out an NFL Draft production that is larger than the previous one — and both took it to a whole new level in 2018 at “Jerry’s World” in Arlington, with Fox Sports also joining the party. 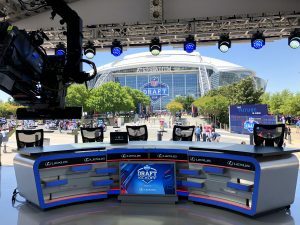 With the Draft located in an NFL stadium for the first time and NFL Network’s early-round coverage simulcast on Fox (marking the Draft’s first appearance on broadcast television), NFL Media rolled out its largest Draft production to date at AT&T Stadium. NFL Network’s 40×40 exterior set was provided by Filmwerks. Although NFL Network and Fox Sports coverage was co-branded and the on-air talent combined, NFL Media oversaw the entire production in Arlington. 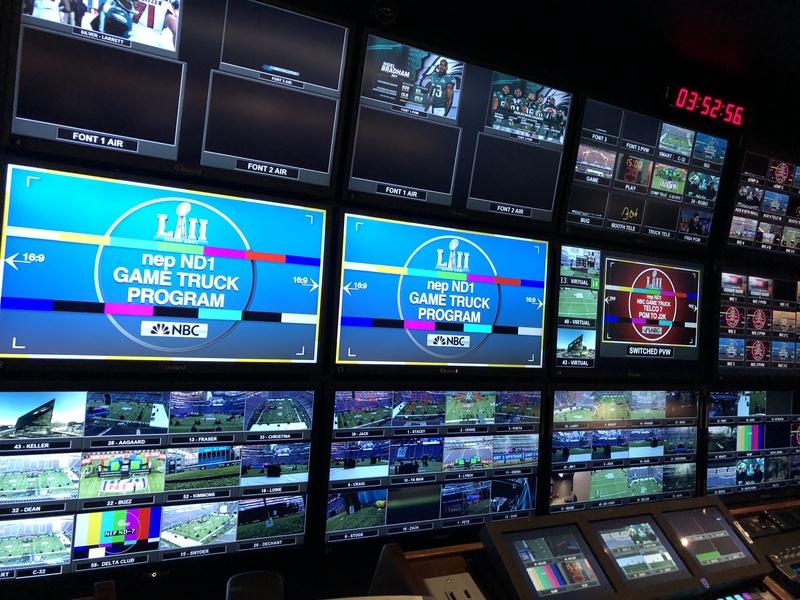 For the second consecutive year, NFL Media rolled out Game Creek Video’s Encore (A, B, and C units) to handle NFL Network’s growing Draft production. It served NFL Network’s two primary sets: the interior set inside AT&T Stadium and the exterior one at the NFL Fan Experience. Game Creek Video’s Pride A and B units were also on hand in the overflow compound outside the stadium, producing Good Morning Football each morning and NFL Network’s Red Carpet Special prior to the start of the Draft on Thursday. NFL Network’s camera complement also continued to grow. The network deployed 32 of its own cameras in Arlington and also took 12 feeds from ESPN. 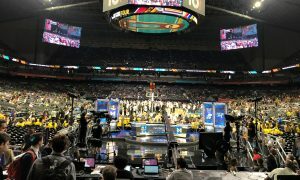 ESPN’s coverage featured first dual-network coverage of Round 1, with primary coverage airing on ESPN and a College GameDay alternate broadcast on ESPN2 — both of which had onsite sets at AT&T Stadium. As a result, ESPN rolled out its largest NFL Draft production to date, complete with several innovations, including a DigiBoom gimbal-stabilized camera rig. Although the primary show was produced out of NEP EN1 (A, B, C, D, and E units) and GameDay operated independently out of its normal Game Creek Video Maverick unit, the two shows were still heavily intertwined. CLICK HERE for SVG’s full NFL Draft coverage. With the Players Championship always played at TPC Sawgrass, NBC Sports and the PGA have refined operations over the years, and the improvements continued to be evident. The biggest improvement to on-course operations for this edition was that there were no longer cable ramps on the course: a lot of effort was put into cutting cable-access paths so that all cables could be buried. In the past, upwards of 40 cable ramps would be on the course, but now the 42 miles’ worth of 12-strand cable were out of sight, an important step for an event that is determined to close the gap with the Masters. At the core of NBC’s coverage were 62 cameras, including 34 wired hard cameras, 13 wired handhelds (including a jib), four wireless RF mini cameras, three tee-box robos, a POV bunker cam on the 17th hole, one robotic camera in the scoring cabin, three small sub-tower robos, an Inertia Unlimited X-Mo, and a FlyCam between the 16th and 17th holes. 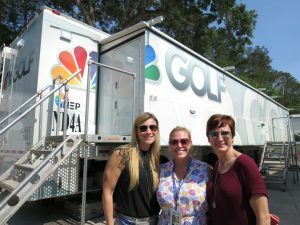 Golf Channel and NBC Sports delivered 90 hours of live programming surrounding the event, and the most notable evolution in its coverage continued to be the rollout of Trackman and Toptracer systems that allow balls to be tracked as they fly. NEP’s ND4/Double Eagle was the main production truck, with SS24 handling the additional camera and replay resources required for the larger golf tournaments. Also on hand were NEP ESU and ND7, producing Live From, which used 13 dedicated cameras, and Launchpad for DirecTV, focused on the 14th hole. CP Communications’ HD11 unit oversaw RF demands. CLICK HERE for SVG’s full coverage from The Players.